If I quantified the number of hours I spent researching car seats while I was pregnant, it’d probably all add up to a full-time job. 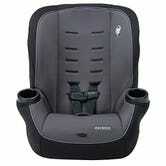 Car seats are one of those items where you really want to make sure you are getting the best one. Because safety, yes, but because also there are so many options, price points, and styles that it can be overwhelming. So, hopefully I can make it a little bit easier to choose by presenting you with my favorite car seats for all your needs. The Chicco KeyFit 30 can seamlessly move from a car to a stroller, and you can even remove its base for easier use in a cab or on an airplane. For those totally clueless (like I once was) the bucket seat is the car seat you see most newborns cruising around in mounted to strollers. It’s a car seat that comes with a base for the car, but can also be unlatched and attached to most stroller frames, meaning you can transfer baby in and out of the car without having to wake them up. We went with the Chicco KeyFit30 because it was highly recommended by friends and family, and after doing some online research, we realized it was the best option out there. The 30 in the name refers to its limits: Babies can be in this bucket seat up until they are either 30lbs heavy or 30 inches long, whichever comes first. It is so incredibly easy to install and use, and can also be used without the base, if you need to take a cab for example. We also used it in an airplane seat without any issues. The Cosco Scenera only weighs 11 pounds, is cerfitied for airplanes, and is easy to clean. It can also hold kids up to 50 pounds. I’ve already shared my top picks for traveling with babies, but I intentionally left out the car seat because I wanted to give it it’s own spotlight. The Cosco Scenera is SO light it is hands down the best car seat out there to travel with. It’s certified to use in airplanes, so if you are like me and like to have your kids strapped in during the flight, this one makes carrying it through the airport a breeze. The cover is also machine washable, so you don’t need to worry about spilled drinks on it. It has a limit of 40 pounds when rear facing, and 50 pounds when forward facing. 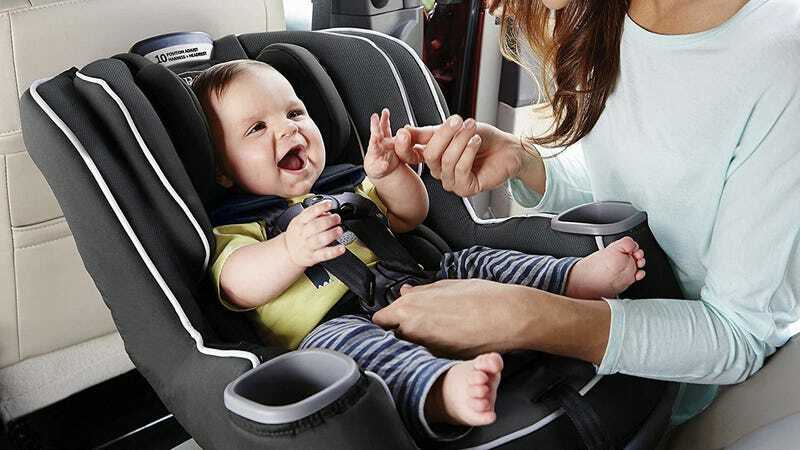 Though it isn’t portable, Graco’s Extend2Fit car seat can be used for kids anywhere from four pounds to 50 pounds, and is full of adjustable parts that you can tweak as they grow. Once our little guy grew out of his bucket seat, we moved onto the Extend2Fit car seat by Graco, which can be used from birth until toddlerhood because of its wide range of weight of 4-50 pounds. 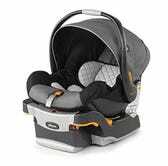 It also has several recline options to make sure your little one is comfortable when they are really little and can move up as they grow. The head rest also moves, so you can always adjust to your kid’s height so they are comfortable and safe. The only reason we didn’t start off with one of these from birth was that we really wanted the ability to carry him around in the bucket seat when he was a newborn, and this car seat is not portable. The Evenflo SensorSafe EveryStage has a whopping 4-120 pound range, and alerts your smartphone if your kid unbuckled themselves, or if you left them in the car. This car seat just came out, and I’m obsessed with it because it solves a major worry for parents: forgetting your kid in the car. The Evenflo SensorSafe EveryStage comes with a smart buckle that, once connected to your smart phone, will alert you of things such as whether the car is too hot/cold, if your kid has unbuckled themselves mid-ride, or if you’ve left them in the car. It’s designed for 10 years of use given that its weight range goes from 4-120 pounds, meaning if you want one car seat only in your life, this is the one. And a reminder: Keep your children rear facing until they hit the maximum weight for that setting, it’s the safest position for them to be in!